Over the years I have tried several different novels that focused on the Lionheart whilst he was on crusade, yet none of them really managed to engage me (although they did make for good sleeping pills). I’d about given up hope on ever finding one that would hold my interest until word came that Sharon Kay Penman was planning to continue her Angevin series with a book on Richard and I was dancing with joy – if anyone could do it, the fabulous Sharon Penman could. Was I bored? I think everyone knows the bare bones of this story, as well as all the myths and legends that have sprung up around it so I’ll pass on trying to recap it and just share my thoughts on the reading experience. I absolutely loved how the author portrayed Richard. He is very much a man of his times, a king and a warrior who did what was necessary to get the job done and keep his men (and women) safe. I loved his sardonic wit, and had many laugh out loud moments. I felt his anguish at some of the tougher decisions he was forced to make, as well as his frustrations with the constant backstabbing and squabbles amongst those who were supposed to be his allies (damn those double-dealing Frenchmen…). His sense of timing and drama were perfection (oooh, that last-minute swoop into Cyprus to save the day once again, you just can’t make that stuff up). And how did Richard’s queen Berengaria fare? Imagine being torn from your home and family, married to a virtual stranger, trekking half way around the world, surviving perils on the high sea, the stench and disease of a military camp and more, yet she handled it like a seasoned pro. Richard’s sister Joanna was another favorite, very much a chip off of the old Angevin block and always there to knock some sense into her hard-headed brother when needed. While I enjoyed this novel a great deal, this is not a light and easy read and is one best read without all of life’s little distractions (no kids) so it can be savored as only a Penman novel should be. The cast of characters is large and complex (there are a lot of POV switches), as well as complicated politics and back-history the reader needs to take in. If you are looking for a light easy read with romanticized view of Richard this is probably not the book for you. Lastly, are you going to have another great love story like Penman gave us in Here be Dragons and The Reckoning? Will they smoke off the pages like Henry and Eleanor in When Christ and His Saints Slept? Can’t tell you that (besides, since there is one more book coming the story is only half told), but I will tell you that Berengaria’s first…ummm…*cooking lesson* was priceless. The bed burning in Here Be Dragons is still tops, but Penmenians* will love it. Review copy provided by the folks at Putnam, thank you. I’m looking forward to reading this too – you’re review has whet my appetite. I was a bit disappointed with Devil’s Brood and the aging Henry and his constant squabbling with his sons and Eleanor. I’m looking forward to something fresh here in Lionheart! I loved Devil’s Brood, squabbling and all. Lionheart is very different. I’ve been working on mine for the last couple of days and hope to post it today or tomorrow. I really need to get back to Penman. Still haven’t read the last couple of books let alone this one! Aah can’t wait to get this! I had some minor crush on Richard in Devil’s Brood 😉 And I still need to read Reckoning. I just got this one in the mail and can’t wait to read it. In the timeline of her other books, can this book stand alone? I haven’t read all her previous books yet and hope it doesn’t matter. I think this book would stand alone, but it would very much help to have some knowledge of those pesky Angevins. They are pretty complicated. 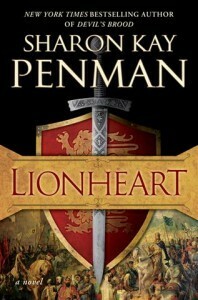 I also enjoyed Lionheart tremendously (my thoughts: http://manoflabook.com/wp/?p=3409). The ladies like Joanna and Berengaria where certainly some of the highlights but I thought the way Ms. Penman portrayed Richard I was fantastic.